Regular Baptist Press released this book at the end of 2012. It is of interest to me because I consider myself a traditional dispensationalist and also because I know some of the authors. 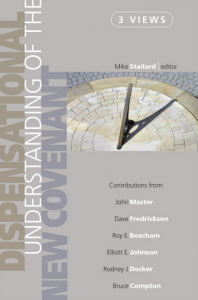 The book is a result of discussions that have taken place at the Council on Dispensational Hermeneutics which has met periodically since 2009 at Baptist Bible Seminary, Clarks Summit, PA, where Mike Stallard is professor of Systematic Theology. I’ve never attended the meetings but they always sounded interesting. I don’t know Mike Stallard but I know one of the contributors well, Roy Beacham, because we were classmates at Central Seminary. I know Rodney Decker through email correspondence and I met Bruce Compton when he was connected with Denver Baptist Theological Seminary in the early 1980s. I wish I could have even heard Elliott E. Johnson speak at some time but I’ve only had the privilege of reading his works over the years. The book presents three views on the New Covenant and its relation to the church, along with rebuttals from the other two authors. The three views offered (though there are more that are not as common among dispensationalists) are Roy Beacham’s view that the church has no relationship to the New Covenant, Elliott Johnson’s view that the church has an indirect relationship to the New Covenant and receives certain benefits from it, and Rodney Decker’s view that the church has a direct relationship to the New Covenant because its scope was expanded in the New Testament. In addition, Dave Fredrickson (Western Seminary) gives a tedious chapter on New Covenant passages, and Mike Stallard gives a most informative chapter on the history of dispensational thought on the New Covenant, including such well-known dispensationalists as Darby, Kelly, Scofield, Gaebelein, Ironside, Chafer, and the Dallas men. I have always taken the view that Johnson presents but I have growing sympathy for Beacham’s view. I may change sometime but not from reading this book.